We were wonderfully created, and we have sweat glands for a reason. Our bodies get rid of toxins through our sweat as well as regulate core temperature. So, why do we add products that block this from happening? Add to this the fact that we absorb whatever is put on our skin, and the idea of putting these commonly found ingredients on our bodies is sickening. 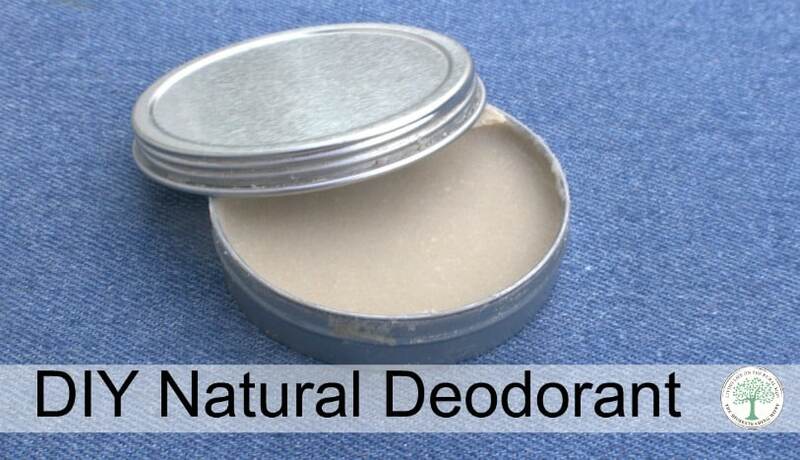 Buying natural deodorants can vary in price and effectiveness. I have had some not work. Not at all. Plus, some that seemed to wear off after about 10 minutes. Then there was some deorodants that worked just fine, but were very pricey for my budget. So, what’s a girl to do in order to “not offend” anyone? Slightly melt the coconut oil with the beeswax. I use a glass measuring jar in a pot of boiling water. Add the clay and mix. Add the arrowroot powder and mix well. Add the essential oils, and mix in. Viola! You have deodorant! Pour into 2 ounce containers and allow to harden. To use, simply apply about a quarter sized amount under your arms with your fingers. You can also use an old deodorant container and refill it. The shea butter will keep it nice and hard, even in the summer time. This recipe lasts our family about 4 weeks, and that is for two adults, and two teenagers. We have never had an issue with body odor using this, and I have not experienced a rash like some have. Do you make your own deodorant? What is your favorite scent of essential oils to add? This looks like something I would like to try. A couple questions though, does it stain your skin or clothes? It looks so brown, seems like it would. Can to recommend other essential oils that would be as effective as tea tree oil? I know it has great antibacterial properties but the scent is not my favorite. Do you think rosemary and peppermint together would work? You mention shea butter in instructions but it’s not listed in ingredients… Wondering how much? Also wondering about the Shea butter. The recipe only calls for coconut oil but in the method it says the Shea butter will keep it solid. Also wonderin if Bentonite clay would subsitute. Also wondering about the Shea butter. The recipe only calls for coconut oil but in the method it says the Shea butter will keep it solid. Also wondering if Bentonite clay would substitute. Oh snap, thanks very much for posting this! It is gonna help me when I buy Coconut Oil at the grocery store! Very Wonderful! Hi Heather! The deodorant I normally make is easy to apply with our fingers. But my husband would like a stick version, so I was hoping to try your recipe out since I’ve saved his old stick deodorant containers to resuse. I have all the ingredients you posted on hand. But can you clarify about the shea butter that you mention in the directions but which is not listed in the ingredients, please? Thanks in advance! yikes! Sometimes, I think faster than I type! I updated it to show the amount of shea butter I use. Sorry about that and thanks for catching that for me! Love this over the baking soda versions. I have tried a similar version, but mine got gloppy. I will try yours for hopefully a better recipe. This sounds like a great recipe. I make a similar one that uses coconut oil, arrowroot and diatomaceous earth. Right now I have lavender essential oil in it. I think I may use Thieves in my next jar. And as a handy hint, if someone is a bit overweight like I am, and has skin folds that get red, sore and “yeasty” (sorry if tmi) this works fantastically to clear that up as well. Just thought I would share.